If you strategically implement lifting straps in your deadlift training, and you've never tried figure 8 style lifting straps, then you might be missing out. We aren't going to tell you that the wheel has been reinvented, or that you're suddenly going to add 50 pounds to your stagnant deadlift, but there are some potential advantages to using the figure 8 straps (depending on your preferences). Important note: Don't rely on straps for deadlifting all the damn time. Nothing in lifting or life replaces a solid grip. Conventional lifting straps wrap once around the wrist, then feed through themselves, then wrap multiple times around the barbell. It doesn't seem like much when you say it, but the process takes some time. This really sounds like a first world lifter problem, but sometimes that extra time to set up can throw an annoying hitch into a lifter's typical deadlift setup. With just a little experience the figure 8 strap allows for a much simpler and speedier setup process. As seen in the pictures below, the figure 8 strap loops once around the wrist/hand, then under the bar, then a second loop goes over the hand. The barbell is effectively secured at the corssover point at the bottom of the strap. Once you've become used to it, this is a much faster process than with typical straps. You'll never feel more locked into the bar then when you have a pair of figure 8 straps on and positioned correctly. DO NOT use these straps if you want the ability to drop the bar from the top of the lift.... because you can't. The bar (or axle) won't be going anywhere, unless your hands go with it. 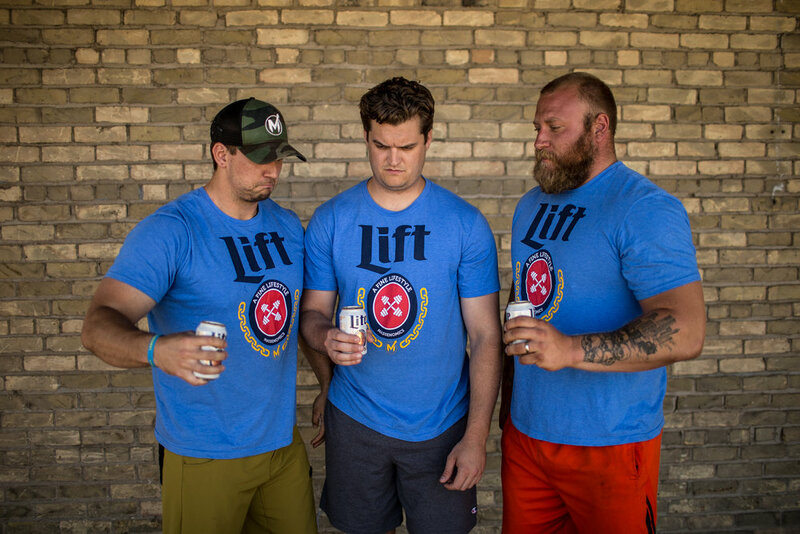 It's actually secure enough that some lifters opt to not wrap their thumbs around the bar. The most notable to utilize that method is Eddie Hall while breaking the world deadlift record with 500KG. The "one with the bar" feeling takes some getting used to, and some lifters may ultimately decide it is not ideal for them. Figure 8 straps are best suited for deadlifting. They can be used with barbells or axle bars if you size them properly. They could also be utilized for various rowing movements. Most commonly you see strongman competitors using figure 8 straps (or straps of any kind) because they can typically be used in competition. Powerlifters, or anyone else training the deadlift, could also have use for figure 8 straps in training, as long as grip training durring the lift is not a primary concern. Like we mentioned earlier, we don't recommend over-relying upon straps for the deadlift. Straps can have a time and a place in training, but don't ever sacrifice a good grip in the process. These straps are NOT ideal for Olympic lifts. That locked in effect created by the figure 8 straps paired with the explosive/overhead nature of cleans and snatches would make for a dangerous combination. Don't worry, the figure 8's are pretty reasonably priced. Pioneer sells theirs for $29.95 plus shipping. And can you really put a price on adding another tool to your gym bag arsenal anyways? They come in either a "deadlift bar" size or a larger "axle bar" size. These Pioneer straps are made of an extremely heavy duty cotton webbing. There is a strong chance that the first pair you order will be the last pair that you ever need to order. That's a wrap...i mean strap. Please share this Massenomics article if you like it. We genuinely appreciate shares. Give our podcast a listen and sign up for our newsletter at the bottom of the page. Check out some of our apparel in our shop, like our "Weekend Warrior" line of shirts and hats pictured below..